Online ordering menu for SANDRO`S TRATTORIA. 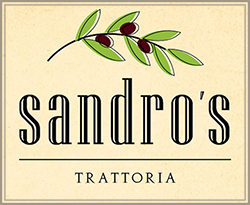 Sandro's Trattoria is a local, family-owned restaurant in Metairie, Louisiana. Since August 2004, we have been serving Sandro's homemade family favorites, using only the freshest ingredients. We invite you to come and try our authentic recipes and visit our friendly staff. Come try all of our delicious entrees that include Eggplant Lasagna, Daube, and Osso Bucco. We also have an amazing array of pasta dishes, paninis, soups and salads, and even dessert! We are located south of I-10 on Veterans Blvd near Lafreniere Park. Place an online order for carryout!